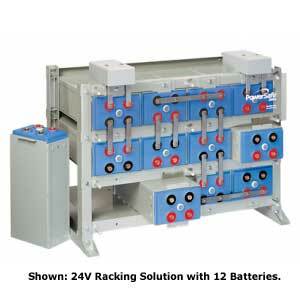 OutBack EnergyCell RE High Capacity AGM Battery and Rack System, 48V (4x6x2V), 1148 Ah @ 20hr, with interconnects (1300RE). The EnergyCell RE high capacity battery family offers an ideal solution for large capacity Valved Regulated Lead Acid (VRLA) battery requirements. 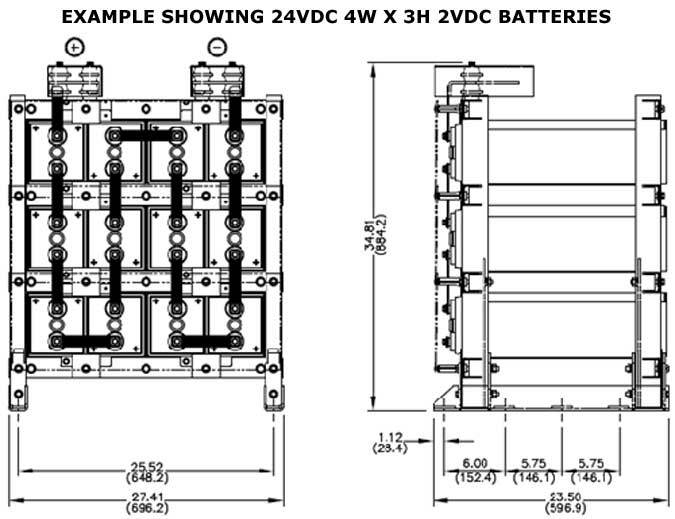 The EnergyCell RE high capacity battery’s steel can (module) design concept, with its integral racking system, provides a cost effective battery system with a compact, quick and simple installation process. Modular Design Composed of 24 (4W X 6H) 2V Batteries, Creating a 48V Battery Bank System. The included racking system is deployed with 4 modules per shelf so a 48 VDC system typically uses 6 shelves. Terminals and connecting plates as well as clear safety covers are also included. 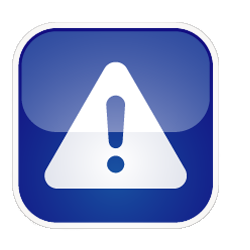 Standard string terminations are for the top of the rack. OutBack EnergyCell 1300RE meets the rising demand for solar grid tied and off-grid energy storage capacity. The needs of home owners who are interested in doing it themselves demand simple to install systems. OutBack Power is responding by engineering its quality recognized line of balance-of-system components into preassembled systems to give customers who are DIY OutBack quality in a more easily installed package. The OutBack EnergyCell and Integrated Battery Rack System is a standardized solution built from the solar industry’s most proven technology and materials in the field of off-grid and home backup power management and storage. As home and cabin owners interest builds in grid-interactive and off-grid solar power systems, OutBack is ready as a one-stop resource with the EnergyCell 1300RE batteries and rack.